From Director Eric Stoltz, Class Rank tells the age-old tale of Beauty and the Geek. Retold through the lens of high school, it highlights the infamous class ranking system, class elections, being an outsider, and unexpectedly finding love. It stars Skyler Gisondo as Bernard, the stick in the mud geek, who demands that the roads be changed to safely allow bicycles. He is constantly rattling off facts, stating why something would be good or bad for him and his interests. Bernard has few friends other than a recluse grandfather who tries to keep him grounded and dispense sage life advice. Bernard then meets the infamous girl next door, Veronica Krauss, starring Disney channel actress Olivia Holt, who is the smarty pants of the school, or she at least tries to be. When Veronica receives her class rank, she finds that the rank she expected is not what she wanted. She then embarks on a selfish journey to enlist the assistance of Bernard since she knows he is campaigning to be elected to the local school board. Veronica’s intentions may seem genuine, but taking a closer look reveals a seedy underbelly of nefarious intentions. She plans to help Bernard with achieving his election in hopes to have the class ranking system abolished. This way she will no longer have to concern herself with trying to be number one each year. From there, the normal high school hi-jinks ensue with prom looming, family craziness, and the day-to-day rigors of being in high school and trying to fit in. Class Rank is beautifully produced, and has fantastic cinematography that showcases high school in a bright light, minus the bullying that is often shoved into these movies. It has its heart in the right place at certain moments of the film, such as when Bernard and Veronica are showing true anger and emotion, or when they are offhandedly asking who they would take to prom. Furthermore, there is a key scene with Bernard and his grandfather, where Bernard is finally brought back down to earth by his grandpa who shows him that life is more than school boards and useless facts. 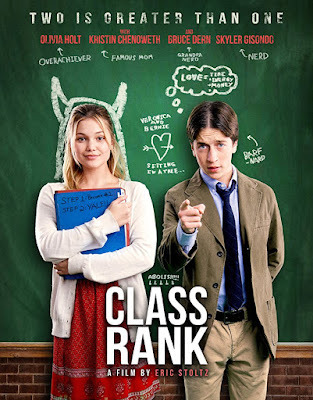 Class Rank clearly draws its inspiration from the famous 90’s movie Election, directed by Alexander Payne, which tells a similar story of high school, elections, and fitting in. Additionally, another film that is similar to Class Rank would be a Disney channel original movie called Geek Charming. This movie recounts the story of Beauty and the Geek meeting up in the most unlikely of circumstances. Class Rank is a mixture of those two films, and is successful in pulling off those themes and emotions to varying degrees. Towards the finale of the film, they tend to veer off course in certain areas. In the end, this film is able to show that it’s more than the sum of its parts. You can see more of Olivia Holt in Girl vs. Monster, and both of the aforementioned films are available to stream on Netflix.